14 Small Bathroom Ideas That Blend Style with Storage and Utility! Home » BATHROOM » 14 Small Bathroom Ideas That Blend Style with Storage and Utility! Less space inside a bathroom sometimes turns out to be a menace when you can’t get ample of room to shower, to work up storage solutions, or integrate the toilet area in to the limited space in a way that doesn’t look an eyesore. However, a little artistry can make even the smallest of bathroom spaces go screaming with style and the right combination of essential elements – just like these small bathroom ideas bundled below. What can be better theme for a bathroom than a spa inspired interiors. This arrangement here features the beautiful spa vibe and the entire room is set up according to it. The long florals placed on the countertop compliment the spa look while the mesh baskets hung for storage add a little rustic touch. For the shower supplies, an additional storage is not used whereas a section is made in the wall to house all the necessary items. The light tones also contribute to the serene appeal. For a rustic lover, this arrangement here is an absolute treat. Right from the mirror to the mesh basket used for toilet paper storage, everything about this setting is rustic. The stunning vintage designed mirror along with the wire basket that comes with a towel hanging bar also adds to the look. For the decor, the wall mounted metal vase over the toilet brings out life on the rather empty wall while the cotton ball stems do the thing. Featuring the gorgeous white and gray tones, this arrangement looks extremely stunning and super classy. Keeping the decor minimal, the main point of focus here is created by the furniture placed in the bathroom. The pop of color is brought by the little rustic looking metal planter. Complimenting the look, the huge vase placed on the corner breathes life into the decor. The intricate designed carpet placed in the middle beautifies the look even more. Featuring the deep tones and a classy appeal, this bathroom arrangement makes a good use of the small space and houses enough room for the shower and the toilet area.The wooden storage with golden lighting adds a contrasting tone to the interior. While the huge shower completes the look as it is extremely stunning. With a minimal decor and keeping the look light, the setting comes with the storage of only the important items. Combining the rustic and classy vibe, this setting features the dark gray tones along with the wooden accents and the cabinet with the weathered texture compliments the theme. Right from the farmhouse baskets to the simple mirror placed on the wall, the arrangement is kept minimal. The little color is flaunted by the beautifully rustic shower wall and the flooring. Even the supplies placed over the toilet display the vintage appeal in the entire look. Despite a small space, the bathroom houses everything perfectly. 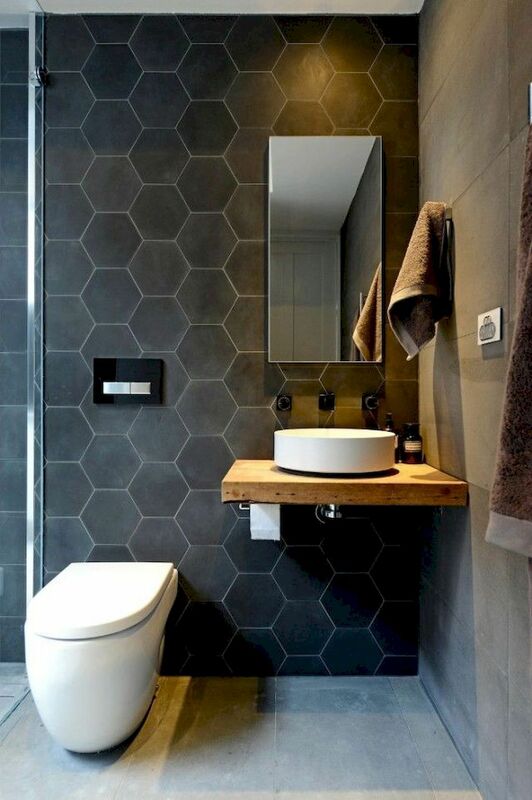 With the honeycomb themed wall and the deep tones selected for the bathroom, it looks extremely stunning and pretty. The sink area occupies minimal space as only the rustic looking countertop can be seen in the interior. The sleek mirror also compliments the look as it keeps it simple and light on the decor. A couple of supplies are placed on the countertop itself so a separate storage is not used for the bathroom essentials. The arrangement provides enough room for proper functionality. Flaunting the all whites color scheme for the bathroom, it houses two divided sections for the shower as well as the toilet that are separated by a wall in between making enough room for both the spaces. The rustic basket placed at the corner breathes a little farmhouse appeal in the super classy interior while a planter kept over the toilet depicts a positive vibe in the bathroom. The setting also comes with a cabinet in front of the toilet space that consists of a little storage for the bathroom.